Currently valued at $2.8 billion, this will enable Vistara to become the first operator of the Boeing 787-9 in India. 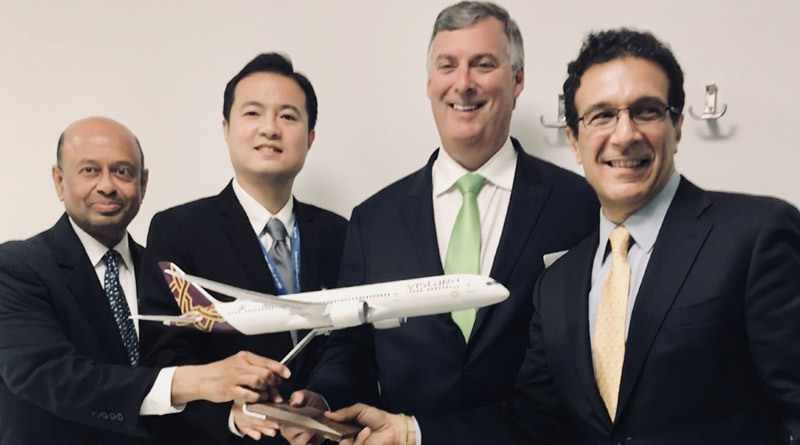 Vistara along with Boeing confirmed that the joint venture between Singapore Airlines and Tata Group, has agreed to order six 787-9 Dreamliners. This includes options for four more jets at the 2018 Farnborough International Airshow. Currently valued at $2.8 billion, this will enable Vistara to become the first operator of the Boeing 787-9 in India. This will also mark the arrival of first widebody airplanes for the Vistara and will help launch long-haul operations.